This tour starts at 3:00PM on Thursday, August 22, 2019 in Paris. Upon arrival at the Paris airport (CDG), you will be met by a chauffeur for a private transfer to our boutique hotel in the heart of the Eiffel Tower neighborhood. 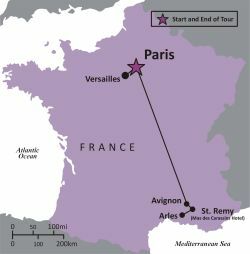 In the early afternoon, we'll enjoy a private, introductory driving tour of Paris highlights: we'll see the Arc de Triomphe, Champs-Elysees, Ile de la Cite, the splendid medieval Sainte-Chapelle church, the Gothic Notre Dame Cathedral, the Latin Quarter, the Pantheon, and the Jardin du Luxembourg. Then, for spectacular views of the sun setting over Paris, we'll ascend to the Eiffel Tower, the city's most famous landmark. During dinner at an elegant restaurant atop the Eiffel Tower, we'll get to know each other, and enjoy an informal discussion about the light side of Paris. On our first full day in Paris, we'll enjoy a gourmet walking tour of the city. In the dreamlike setting of Paris' most beautiful neighborhoods, we'll explore the history of events that made the city the world culinary capital, as we indulge in the most exquisite foods in existence. We'll walk through the medieval Latin Quarter, visit a colorful market, a cheese dairy, bakeries, coffee shops and a regional specialty shop, enjoying rich flavors of foie gras, wine, cheese and bread, which will introduce us to the French gourmandise. In the afternoon we'll visit Musee d'Orsay, located in a Beaux-Arts building that used to be a railway station. We'll have a light lunch at the museum and explore the world's largest collections of both Impressionist and Post-Impressionist masterpieces. The evening will be free to pursue our own individual interests through the glittering streets of Paris. Today, we'll venture out of the city, to Giverny, where we'll have a chance to appreciate the Impressionist masterpieces of Claude Monet, as we tour his house and the waterlily gardens. Afterwards, we'll visit Versailles, the world's most famous royal palace. We will tour the Royal Apartments, the newly restored Hall of Mirrors, the famous gardens with the Orangerie, and admire the dancing fountains and Marie-Antoinette's Estates. After returning to Paris there will be free time to relax or to explore Paris at night. After breakfast, we'll continue our exploration of Paris, as we take a private guided tour of one of Paris' most celebrated museums. In the morning, we'll visit the famous Musée du Louvre, once a royal palace and now a renowned art museum containing one of the world's most important collections of art and antiquities. We'll then have some time for individual exploration of the museum before returning to our hotel via metro, and the afternoon will be free to relax or explore the lively area around the hotel. In the evening, we'll enjoy another Parisian highlight - a night time dinner cruise on the Seine River to see for ourselves why Paris is called the City of Lights. In the morning, we'll take the fast TGV train, and for a total change of mood and scenery, arrive in sun-splashed Avignon, in the heart of Provence at lunch time. After settling at our Provencal villa, there will be time to take a walk around the town of St. Remy or to relax at the villa's beautiful gardens by the swimming pool. Aperitifs and dinner will be served at the hotel's elegant, Provencal style restaurant. On our first full day in Provence, we'll see one of the most beautiful villages in France: Les Baux de Provence, then travel 2,000 years back to the Roman city of Arles. Originally founded by Greeks, Arles was favored by Caesar and flourished as one of the most important provincial cities of the Roman Empire. Like many towns built by Romans in the "provinces" or Provence, it resembles a miniature Rome with its own arena, Theatre Antique, thermal baths and the Forum. We'll visit the striking Roman monuments, walk the labyrinth of narrow streets and visit Place du Forum Cafe, immortalized by Vincent Van Gogh in his painting, Café Terrace at Night. Today, we will experience more delights of Provence, as we travel though the fairytale countryside, stopping in picturesque villages with their unforgettable antique markets. Then, we'll continue to Avignon. Named Altera Roma, Avignon retains the mark of a hundred years of the Popes' stay in the city, when it was the capital of the medieval western world. Today, it is the cradle of Provencal literature and theatre revival. After an optional lunch at a Provencal cafe, we'll visit the Papal Palace, the largest Gothic palace in Europe, stroll through the narrow alleys and expansive plazas, shop or even give in to the musical lyricism of Pont d'Avignon. In the morning, we'll visit the Roman built architectural marvel of Pont du Gard, the multi-story aqueduct over the Gard River, built to supply clean water to the town of Nimes. In the afternoon, we'll experience Chateauneuf-du-Pape - a village dedicated to its world famous wine. We'll tour the vineyards, visit the wine making museum and, of course, sample some excellent Provencal wines. We'll also enjoy a chocolate and wine pairing session, and a vineyard picnic at a private, wine producing estate. We'll spend our last day in Provence with our new friends, learning to appreciate the cuisine of Provence. More than just recipes and techniques, this cooking class will introduce us to the Provencal way of life: life based around friends, wonderful food prepared from the freshest local ingredients, good wines, blue skies and laughter. After the guided morning visit to the market, we'll engage in preparation of a spectacular meal which will celebrate your journey in this most blessed region of France. Today, we'll say good-bye to Provence, and catch the TGV train back to Paris, and we will be arriving at the Charles de Gaulle Airport in the late morning. The tour ends at 10:30AM on Saturday, August 31, 2019 at the CDG Airport in Paris. Your flight should leave after 1:00PM.